Dr. Rahul Patwari discusses Salter Harris fractures in pediatric patients with a helpful mnemonic to help you remember the categories. He also poses several questions in the first video, which are answered in the second video. Pediatric Appendicitis: CT or Ultrasound? Appendicitis is the most common pediatric surgical emergency accounting for 5% of urgent pediatric outpatient visits for abdominal pain. Computed tomography (CT) and ultrasonography (US) are two imaging modalities used in the diagnostic evaluation of acute pediatric appendicitis. Both have decreased the incidence of negative appendectomy results. It is well known that CT has greater diagnostic accuracy than US for diagnosing acute appendicitis, but there is concern over long-term cancer risk, with routine use of CT in children. What modality should be used for pediatric patients who are suspected of appendicitis? Limping is a common reason for parents to bring their children to emergency departments. It is known that 77% of acute, atraumatic limp is dealt with in the ED, and 20% do not even complain of pain.1 Our job as physicians is to complete appropriate assessments to not miss any serious pathology. 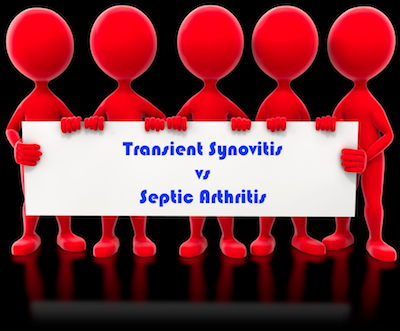 Specifically, differentiating between transient synovitis (TS) and septic arthritis (SA) of the hip can be difficult and frustrating for everyone. What is your approach? The Case: A 8-day-old, uncircumcised male is brought to the ED with fever, irritability, and decreased urination. Patwari Academy videos: Pediatric head injury – To CT or not? When would you obtain a CT for a pediatric patient who sustained a head injury? Watch this nice 11-minute video review by Dr. Raul Patwari, discussing the 2009 Lancet PECARN study. MIA 2012: Pearce MS et al. Radiation exposure from CT scans in childhood and subsequent risk of leukaemia and brain tumours: a retrospective cohort study. Lancet. 2012 Aug 4;380(9840):499-505. Interpret this data how you will: Exposure to 2-3 CT scans of the head will triple the risk of brain tumors; 5-10 head CT scans will triple the risk of leukemia. In absolute terms, this translates into approximately 1 excess case of leukemia and 1 excess brain tumor per 10,000 patients. Fracture or a normal ossification center? This is a common question heard when viewing an xray of a pediatric elbow. How do you remember the timing of normal ossification centers? FYI, the xray images above are normal and have no fractures.